this week, another installment of fantastic thai-muslim music! 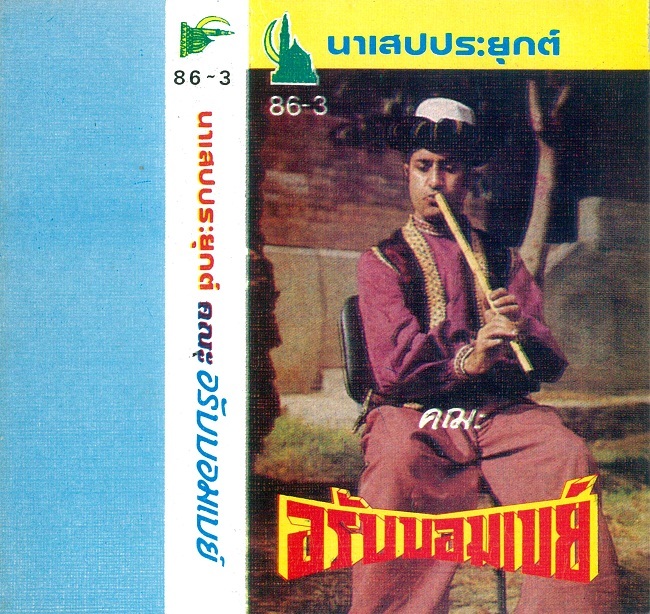 this cassette features a prayuk or "applied" version of the malay nasib. for a description of that genre, let me defer to jon ward, of the inimitable excavated shellac: "nasib, or "song of fate" ... is an aching, slow lament; a deeply melancholic popular song type which is built around the singer’s misfortune in life ... the origins of the nasib derive ... from indonesian/malaysian stambul theater music ... where theatrical groups would perform musical dramas, many with stories which had origins in india or the middle east ... nasib is sung by a singer who is in fact playing – or at the very least channeling – a character or situation from these classical stories, rather than singing [t]he[i]r own blues." here the characters of nasib take one step further in their journey! in it's prayuk form, thai nasib seems to stress group participation, with a solo singer & chorus trading call & response, as well as greater variations in tempo.. whether these are local innovations or a return towards the genre's theatrical routes, i couldn't tell you. i also wish i could say more about our performers, khana arab bombay, but i can't find anything. any further information would be greatly appreciated... until then, enjoy! hey, what is yr coversion process for cassettes? also, if i sent you some cover scans, would you help me out with translations or some back story? i ran across a stash of twenty or so thai pop tapes (i can only assume it's from the eighties?) & since i don't really have very much knowledge outside of what you've posted, any help would be greatly appreciated. you could contact me at burntoutsavannahs@gmail.com thanks a ton buddy! for conversion i just run an old sony wm-fx888 through my laptop's line-in! nothing fancy. as for the tapes, if you have scans, please feel free to send them them my way! i'm always happy to help with translation/information, if i can. i'll email you shortly. The file seems to have been removed from Mediafire. Could you re-up it? Really curious to hear this one. Love the arab-malay stuff. thank you for letting me know... looks like it was (mistakenly, i assume) flagged in some mass submission by some french anti-piracy company. bizarre. i will get it back up as soon as i can and post a comment here once it's done! hey. another blog i follow had half his links shut down by a French man claiming to own the copyright. this is a dreadful shame; i hope you get your links back soon. wow, thanks for all the information, guys. here i was assuming it was an honest mistake! this is the first time it's happened, so i'm planning to get the file back up on mediafire by tomorrow. if i still have problems after that, i'll look into a switch.. thanks again! new link is up, let's see if it lasts!